Light in the Piazza is a 1962 American romantic drama film directed by Guy Green and starring Olivia de Havilland, Rossano Brazzi, Yvette Mimieux, George Hamilton, and Barry Sullivan. Based on the 1960 novel The Light in the Piazza by Elizabeth Spencer, the film is about a beautiful but mentally disabled young American woman traveling in Italy with her mother and the Italian man they meet during one leg of their trip. 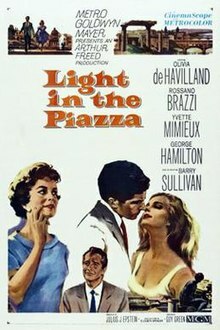 Distributed by Metro-Goldwyn-Mayer, Light in the Piazza is notable for its extensive location shooting in 1960s Florence and Rome by the award-winning cinematographer Otto Heller. While taking a summer holiday in Florence with her mother Meg, 26-year-old Clara, an American, meets and falls in love with a young Italian named Fabrizio Naccarelli, played by George Hamilton. Fabrizio is blinded by his love for Clara and believes her mental disability to be simple naivety. Meg tries to explain her daughter's condition to Fabrizio's father but the opportunity never seems to be right. Fabrizio's family are taken with Clara and her simple remarks are taken as evidence of her innocence. Meg spends the remainder of the trip trying to keep the two lovers apart and fearing that Fabrizio or his family will discover the truth about her daughter. She moves their holiday quickly to Rome in the hope that Clara will soon forget Fabrizio. On discovering how unhappy this has made Clara, she calls her advertising executive husband, Noel, and asks him to fly to Rome to meet them. The couple discuss their daughter's future, and Noel reminds her that Clara's previous suitors have been repulsed as soon as they discover she is mentally disabled. He also reveals that he has made plans for Clara to be placed in an expensive care home for the mentally disabled. Meg is set against what she sees as the incarceration of her daughter for the rest of her life. The couple argue, and Noel returns to America. Meg realizes that Clara will have a much better life as a wealthy Italian wife with servants and inane gossip to entertain her than in such a home. She returns to Florence and does everything she can to expedite the marriage without her husband's knowledge. Fabrizio and Clara are overjoyed and plans are made for the wedding. Clara begins religious conversion to become a Roman Catholic and the priest instructing her is impressed with her childlike devotion to the Madonna. This, together with the Naccarelli family's connections in the Catholic Church, allows the wedding date to be brought forward. When Fabrizio's father glances at Clara's passport as they settle the wedding arrangements, he is suddenly alarmed and flees the church without explanation, taking Fabrizio with him. Meg fears he has somehow deduced Clara's mental age and does not want his son to marry such a person. Eventually, Signor Naccarelli visits Meg at her hotel and says she should have told him that Clara is 26. In Italian culture a young man of 20 cannot marry an older woman without controversy. He tells his son of the age difference but Fabrizio reminds his father that his age is actually 23 and that he so loves Clara that he cares nothing for this slight difference. The situation is quickly resolved in Signor Naccarelli's eyes when Clara's dowry is increased from $5,000 to $15,000. The wedding takes place in a church in Florence without Noel's presence. The story first appeared as a novelette in The New Yorker in June 1960. MGM purchased film rights in August and assigned it to producer Arthur Freed, while the novel version of the story was published later that year. Julius Epstein received the task of writing the script. Guy Green was given the job as director on the strength of The Angry Silence. Actresses who tested for the female lead included Dolores Hart before producers selected Yvette Mimieux. Tomas Milian was originally cast as the Italian groom. George Hamilton campaigned actively for the role even though it had been cast and eventually succeeded, in part by persuading Ben Thau he was suitable. According to MGM records, the film earned $1.2 million in the US and Canada and $1 million elsewhere resulting in a loss of $472,000. ^ a b The Eddie Mannix Ledger. Los Angeles: Margaret Herrick Library, Center for Motion Picture Study. 1962. .
^ "Light in the Piazza". Turner Classic Movies. Retrieved 2015-08-10. Spencer, Elizabeth (1960). The Light in the Piazza (First ed.). New York: McGraw-Hill. OCLC 290337. Thomas, Tony (1983). The Films of Olivia de Havilland. Citadel Press. ISBN 978-0806508054. This page was last edited on 30 December 2018, at 01:35 (UTC).